Every publisher is on the look-out for a successful formula, and as New Scientist has discovered, its series based on the Last Word column, where readers' scientific queries are addressed by other readers, are big sellers. 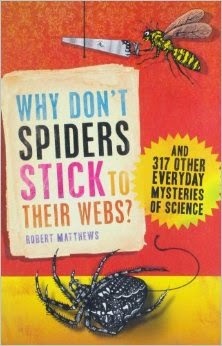 Another success in the 'quick answers to scientific questions' field is Robert Matthews' Why don't Spiders Stick to their own Webs, featuring columns originally published in the Sunday Telegraph. But the difference here is that, where Last Word answers tend to read like a lecture by a pernickety academic (or a scientifically inclined comedian), Matthews gives us his wisdom like a benificent and well-read uncle, entertaining his guests at the dinner table. All in all, it's highly entertaining stuff. You will enjoy yourself, learn a bit, and gain several 'Did you know...?' stories to entertain friends and relations. The only problem with the book is that it is getting a trifle elderly and could do with an update. It was originally published in 2005 and doesn't seem to have been updated since. Specifically, this tends to impact on medical and dietary questions, where advice has moved on, including the strong evidence against homeopathy being anything but a placebo effect, which makes Matthews' support for it look rather odd. Perhaps the most obvious failing is when he answers the question 'Why does a magnet held near a television produce weird colours' and gives an answer that assumes everyone's TV and computer monitor is still a cathode ray tube. This is a book that predates flat screens.